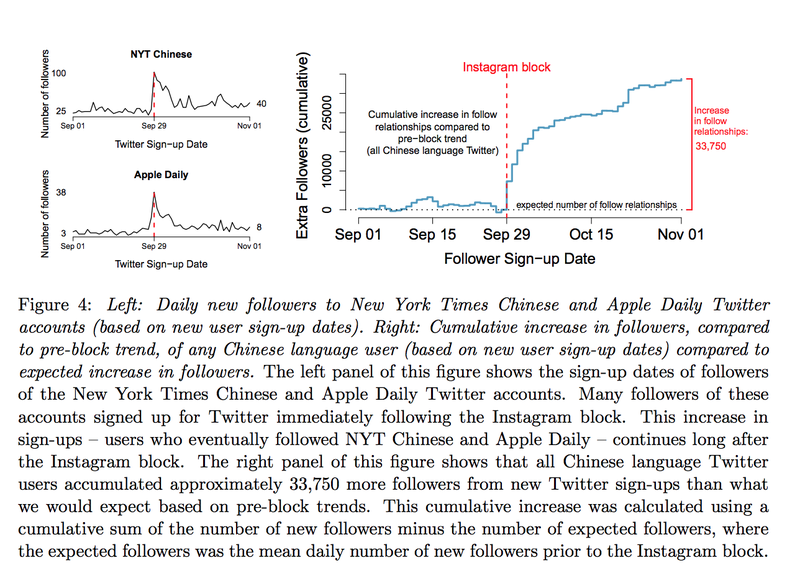 Your research (pdf) analyzes a specific censorship event: China blocking Instagram in 2014. Why did the Chinese government block access to Instagram in 2014, and how did China-based Instagram users react? The Chinese government blocked Instagram in Mainland China on September 29, 2014, which was the third day of the September 2014 sit-in protests in Hong Kong. These protests opposed electoral reforms that were being proposed by the mainland Chinese government. There were no such protests in the mainland, but there were photos of the protests on Instagram. So the Instagram block might have been intended to prevent the spread of unrest from Hong Kong to Mainland China. Overall, the block decreased the use of Instagram. We used geo-located Instagram data to estimate the number of people who used Instagram in Mainland China over September and October of 2014. Our data indicated that the main effect of this block was that about half of China-based Instagram users no longer accessed the site. However, this also meant that a substantial number of people continued using Instagram despite the block -- about half of users found ways to continue using Instagram, including downloading a VPN to jump the Great Firewall. Were people in China only using circumvention tools to access Instagram after it was blocked, or other sites as well? Yes. Even though half of mainland users stopped using Instagram, the other half found ways to circumvent censorship using a Virtual Private Network, or VPN. VPNs allow users to "jump" the Firewall by routing through a computer outside of China. We found that the Instagram block motivated many users to download VPNs to access Instagram. Once they started using VPNs, it was suddenly easy to access many websites that had been blocked in China for a long time, including Facebook, Twitter, and certain politically sensitive pages on Wikipedia. 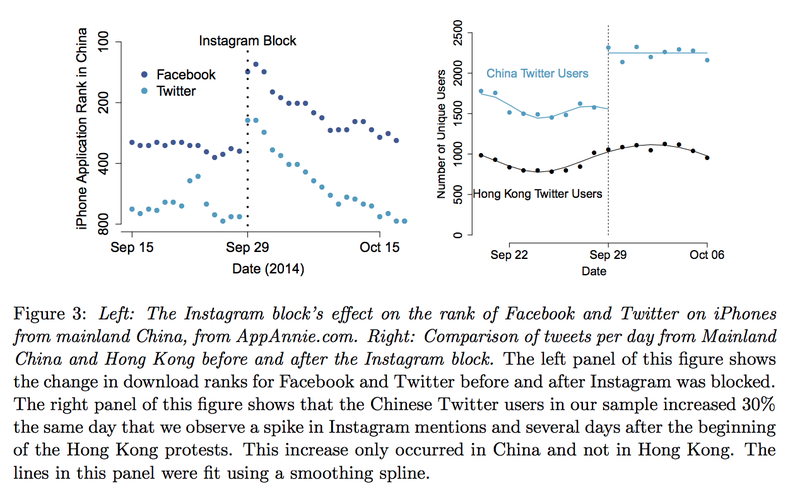 Not only did the popularity of VPN applications skyrocket in China on the day of the Instagram block, so did downloads and use of long blocked websites, shown here in Figure 3 and Figure 4. Though China’s motivation for blocking Instagram appears to have been politically motivated, Instagram is itself not an inherently political platform. Did Instagram’s block appear to have any effect on what types of content users engaged with? That's right. Our Instagram data showed that most users on Instagram probably used the site to look at friends' photos and to follow celebrities. There wasn't much talk about politics on Chinese Instagram, and that didn't change after the block. But a lot of the Instagram users in China also began accessing other, more political information on Twitter and Wikipedia after the block, since those sites were easy to go to once they were already on VPN to view Instagram. For example, there was a spike in views of Chinese language Wikipedia pages on Tiananmen Square and Communist Party leaders right after the Instagram block, and people in China who signed up for Twitter (which is more political than Instagram) after the Instagram block started talking about the Hong Kong protests about a day after they started using Twitter. Your study analyzed a censorship event that occurred in 2014. Given the pace of China's technological development and longstanding prowess in the domain of censorship, what implications does this study have for Chinese internet users today, and online information controls writ large? The Great Firewall in China, similar to many forms of censorship in China, is not water tight. It is not prohibitively difficult to use a VPN  to jump the Firewall, since it just takes some time and money. Still, the Great Firewall is very effective in that relatively few people in China use VPNs. In Molly's book Censored: Distraction and Diversion Inside of China's Great Firewall, she estimates that only 1-5% of the Chinese population regularly jump the Firewall. Why don't people jump the Firewall if it's possible? Mostly because it's too annoying or because they don't feel a need to. Internet users in China (and around the world) are impatient and have short attention spans online. Most Internet users are not willing to spend a lot of time searching out a particular piece of information online. For this reason, censorship that creates small inconveniences and costs for access -- what Molly calls in her book censorship through "friction" -- can have big effects on what information people access. The Chinese government uses friction frequently as a form of censorship: by slowing down websites, hiding or removing search results, or removing individual social media posts. None of this makes information impossible to retrieve, but still has big effects on Internet users because it makes information more difficult to access. The Instagram block shows that even though the Great Firewall is effective most of the time, there are moments when people are sufficiently motivated to spend the time and effort to evade censorship. Even though the Instagram users could have used a VPN before Instagram was censored, only after Instagram was blocked did they download a VPN and gain access to Twitter, Facebook, and Wikipedia. This shows that what is outside of the Firewall and whether or not people are accustomed to using blocked websites matters a lot for whether or not people will be willing to evade it. Of course, China is not the only country in the world implementing these sorts of internet restrictions like blocking access to popular social media sites, especially in reaction to political expressions of dissent. What implications, if any, does your study have for censorship events elsewhere? Would you expect to see a similar sequence of events play out elsewhere, where access to information increases following a block? Usually, censorship decreases access overall to information by making information more difficult to access. What the Instagram block shows is that there are times when censorship can actually expand access to information for a set of people. This can happen when some websites become suddenly blocked, thereby motivating people to seek out evasion tools that can often be more widely applied to other websites that have long been censored. This type of "gateway effect" should happen in other countries and contexts when information becomes censored. 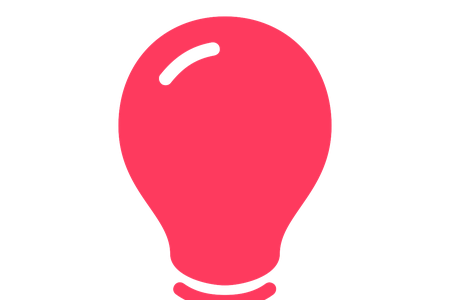 We expect it to happen more when 1) a platform is suddenly censored, rather than gradually censored, 2) the censored platform is addictive and has few substitutes 3) the way that people evade censorship to access the platform can be applied to other types of information and 4) when there is a low probability of punishment for evasion. Though Apple’s removal of VPNs from its App Store in 2017 after the Instagram block made acquiring VPNs more difficult. For example, Vietnam found censoring Facebook futile because too many users learned to circumvent the block in order to access it (see http://www.viettan.org/IMG/pdf/Viet_Tan_-_Vietnam_s_Social_Media_Landscape_March_2015_.pdf). Similarly, a recent social media tax in Uganda has motivated many users to seek out evasion technology (see https://observer.ug/news/headlines/58064-ugandans-again-run-to-vpn-as-social-media-tax-starts-to-bite.html).